Lately I've been revisiting the High's permanent collection, specifically the American art from the late 19th and early 20th centuries. One of the paintings that really has a hold on me is a vivid green Fauve-influenced take on leaves by expat Virginian, Patrick Henry Bruce. 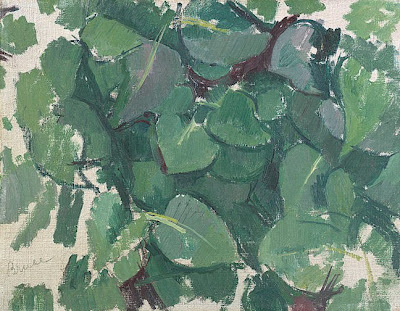 It's from around 1910 when he was in Paris studying with Matisse and, at the same time, very inspired by Cézanne's style. 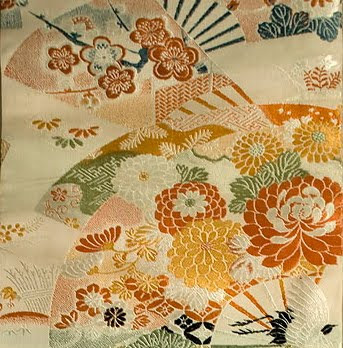 (Spanierman Gallery has another lovely example of Bruce's work from this period, shown above.) Later Bruce became influenced by Sonia and Robert Delaunay and Orphism but, as Grace Glueck notes here, throughout his life Bruce was sadly under-appreciated. Tides turn, though, and decades after his death scholars and gallerists came to admire his contribution as an American Modernist. 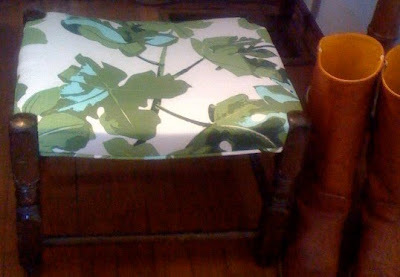 Right now, most of the prices for Bruce's paintings exceed my budget, so I used my very last scrap of Fig Leaf on a smaller footstool that may or may not be the same age as his earlier works. 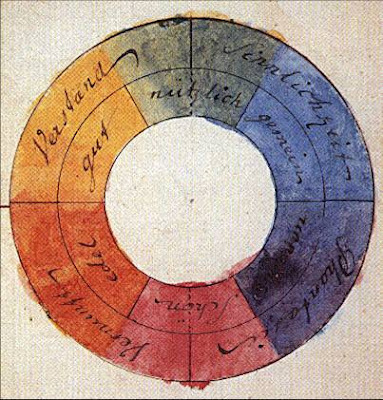 Everytime I look at it, I think of the High's painting. For any designer looking to be inspired by rich turquoise-blues, greens and purples, these hues can be found in abundance in the High's galleries of early-20th-century American art (pottery, glass and paintings). The collection also includes a tiny gem, View of Fez, one of Henry Ossawa Tanner's less conservative paintings influenced by his Moroccan travels. And I always like to stop and study the small works by George Ferdinand Of (1876 - 1954). By the way, LACMA has more information on Tanner in Tangiers. Patrick Henry Bruce's work is included in Picasso and the Avant-Garde in Paris, currently on view through April 25 at the Philadelphia Museum of Art. As the Museum explains, Bruce was among the artists who followed Picasso’s example and moved to Paris during the first half of the 20th century, a critical period in the history of art. I recieve no compensation for talking about Fig Leaf. Just obsessed with it. 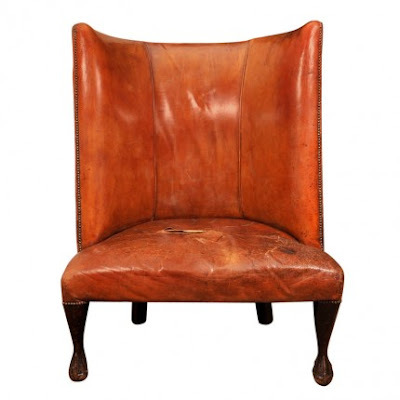 Speaking of passion for art and design, click here to learn about the Vogel Collection. 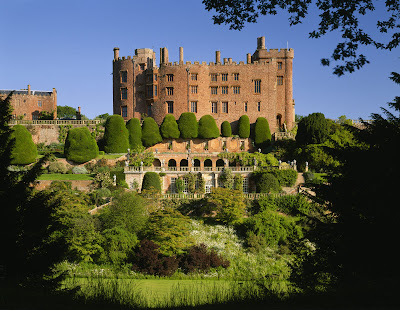 This morning, courtesy of The National Trust, I have some vivid images of the Indian collection at Powis Castle in Powys, Wales. 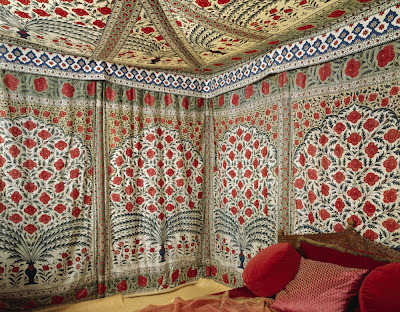 Shown above is an 18th-century Indian chintz tent, now preserved at the Castle, that originally belonged to Tipu Sahib, the Sultan of Mysore. The tent was acquired by Edward Clive, 2nd Baron Clive and 1st Earl of Powis, after Tipu was defeated by the British in 1799. The pieces at Powis also include objects brought back by Edward Clive's father, Robert Clive, known as 'Clive of India'. Today, Brigitte Singh's Mughal-inspired cotton block print Poppy on White is available through Aleta Bartel-Orton. 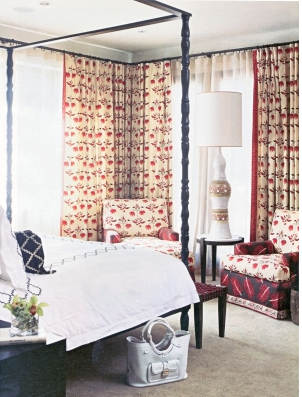 Lulu DK's Moondance curtains give the bedroom above a contemporary global-chic feel. 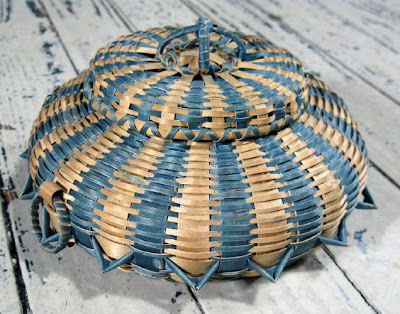 And Michael Smith offers Moghul Panel as part of his Jasper line. 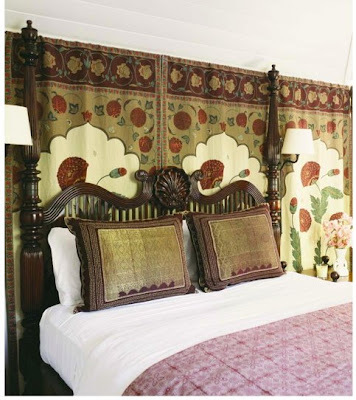 Not surprisingly, Tipu, the Sultan of Mysore, had opulent taste. Above are his slippers. 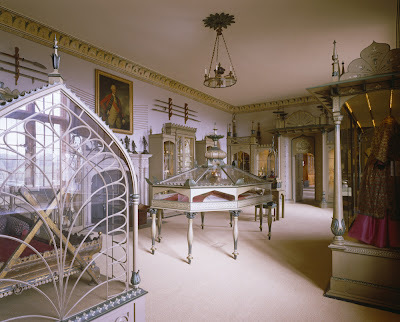 At Powis, the objects are displayed in cases created in the late 1980s and inspired by the Anglo-Indian style of the Royal Pavilion, Brighton. 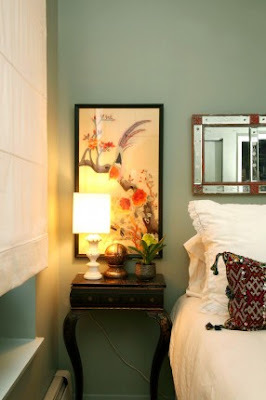 Related past post: Indian Florals. 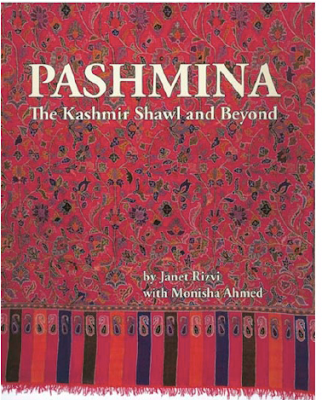 Initially I only planned to mention an intriguing post about color in oriental rugs and textiles over at R. John Howe: Textiles and Text, but then I remembered these ravishing images from Hali's review of Pashmina: The Kashmir Shawl and Beyond (Marg Publications 2009). 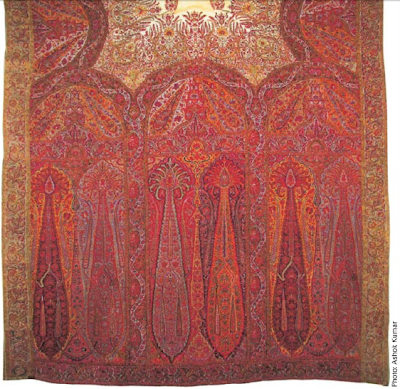 Writing for Hali, Steven Cohen described the book as a much needed, refreshingly fact-based volume about a type of Indian textile that has often been misrepresented. So, textile enthusiasts might want to add this one to their bookshelves. 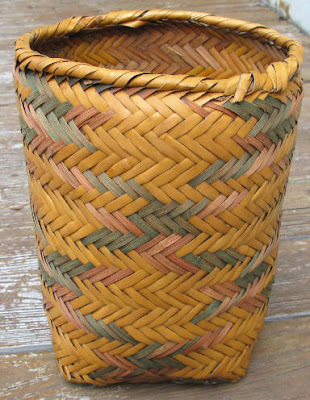 Personally, after reading the R. John Howe color post, I'm seeing all sorts of woven things in a new light. R. John Howe: Textiles and Text offers coverage of The Textile Museum's morning programs. In short, a virtual version of the lectures that visitors in Washington, D.C. experience. 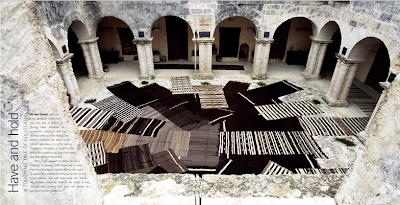 Wendel Swan's talk about the appeal of color in rugs was especially interesting. Click here to learn what Swan means when he says, in rugs, colors are like "musical chords" and the context of the hues alters our perceptions. 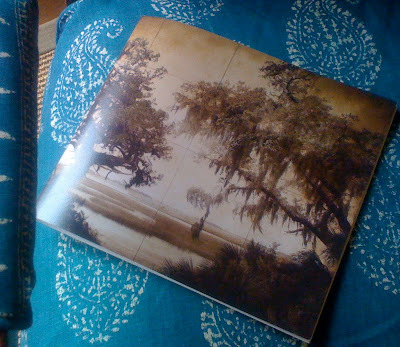 Okay, I've already posted the cover of the exhibition catalog for Lure of the Lowcountry, on view in Charleston, South Carolina at the Gibbes Museum of Art through April 18. But fans of contemporary artist John Folsom can also see an example of his work in the Curator's Corner at Spotlight on Art in Atlanta through Saturday, February 20. The Curator's Corner (literally a corner of the open-to-the-public Artists Market) highlights art that will be auctioned during the Gala on February 27 at 6:30 p.m. at the Georgia Aquarium. In case you're just tuning in, here's the full scoop on the free-admission Market. 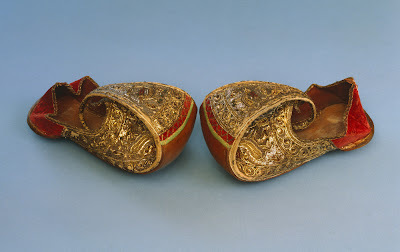 And speaking of the Gibbes, click here for an interesting museum blog post about art on the road. The National Trust describes Calke Abbey as a very old British country estate in Derbyshire (early masonry found on the property dates back to the Elizabethan age) that has been preserved in a state of 20th-century decline..."a place poised somewhere between gentle neglect and downright dereliction..." Visitors to the house become acquainted with the eccentric Harpur family who, I was told, seem never to have thrown anything away. 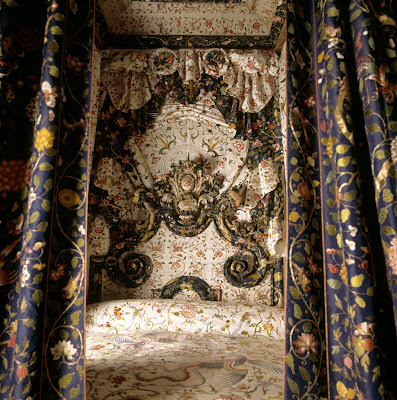 The bed with the amazing embroidered Chinese silk hangings was probably made for King George I around 1715. 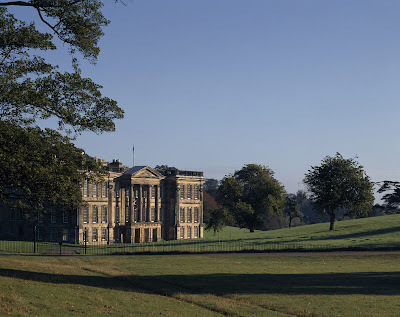 It appears to have come to Calke in about 1734, as a gift from Princess Anne (daughter of George II) to her former maid of honor Lady Caroline Manners when she married Sir Henry Harpur, 5th Baronet, and went to live at Calke. 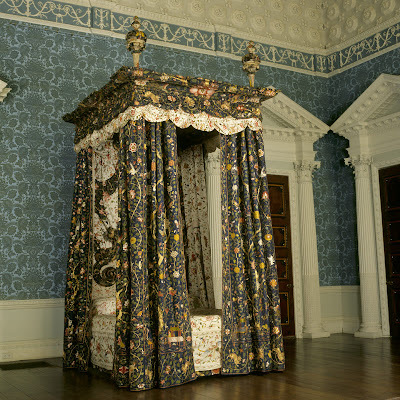 Apparently the bed was mostly kept boxed up and was only properly revealed after the National Trust took over the house in 1985. In addition to the bed, Calke is home to a collection of countless 19th-and 20th-century household objects and curiosities. Click here to read Janet Blyberg's insights on Calke, A Case for Benign Neglect. Just came across the Corrie McCallum-William Halsey Foundation page over at Carolina Arts. I still heartily recommend Gibbes Interactions (scroll down and click on the painting titled Search) for a truly dynamic and comprehensive intro to the Charleston-born abstract expressionist, Halsey, but the Foundation page offers additional background. 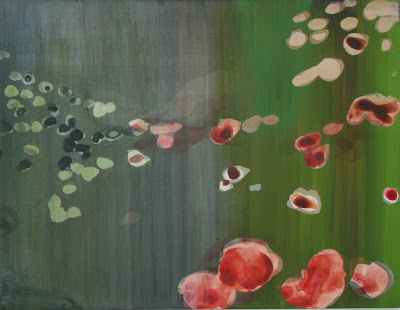 Caroline Cobb's thesis on the painter is posted, and the career of Halsey's wife, Corrie Parker McCallum, is covered too. It's fun to browse examples of her work, including the paintings from the globe-trotting 60s. 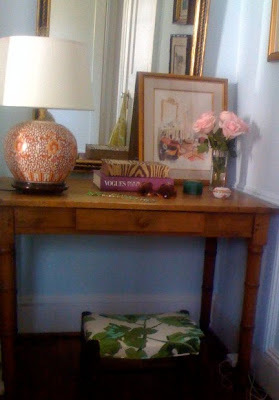 Click here to see a Halsey in designer Muffie Faith's dining room. Thinking about a late spring jaunt to New Orleans? Opening just about when spring turns to summer is a new exhibition of Mississippi-born artist Andrew Bucci's watercolors. 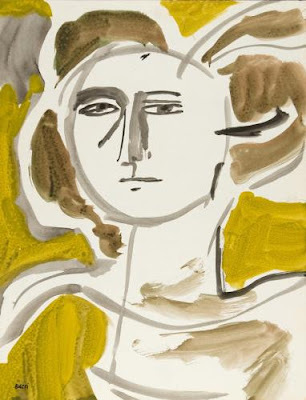 From May 30 to June 27, 2010, Cole Pratt Gallery will show Bucci's mid-century "Face" paintings including works not previously seen by the public. For new readers, here's a little Bucci synopsis from some of my past posts. 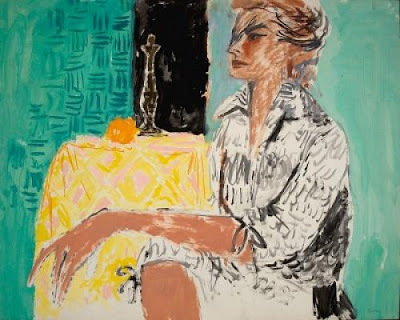 Cole Pratt Gallery director, Erika Olinger, explains that the mid-century era was the heyday for a style of Bucci's work that was abstracted yet still somewhat representational. 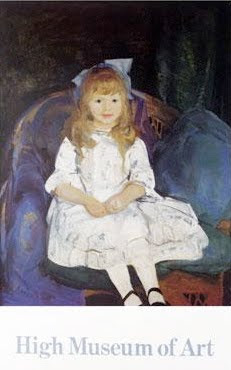 In later decades his paintings became deconstructed, and great examples of his range can be seen here and here. 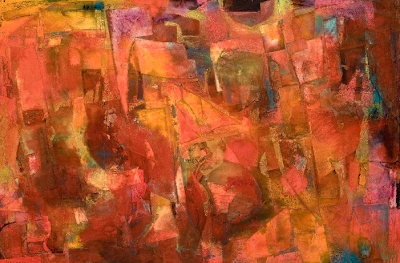 Many collectors respond to the Fauve-like hues that are ever-present in the 1950s pieces. In 2009, at age 87, Bucci was chosen to receive the Mississippi governor's Lifetime Achievement Award for the arts. 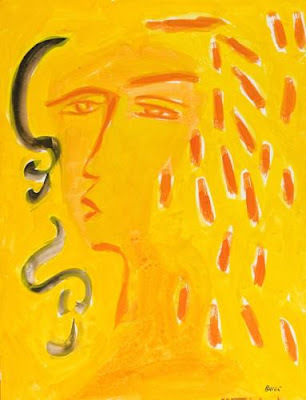 Influences over the years have encompassed Matisse, Japanese woodblock prints, and noted Southern artist and teacher, Marie Hull. I once saw a makeover show on HGTV (I'm guessing it was Kenneth Brown's reDesign) that involved a couple's dispute over the husband's vast record collection. 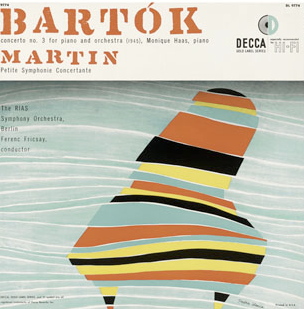 The wife, and quite a few television viewers, probably assumed that the interior designer would suggest banishing the albums, but instead he creatively incorporated rows of the colorful old record covers into the revamped room. 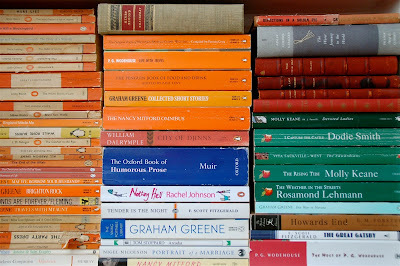 I can't remember if the album edges were grouped by color, like Lisa's books above. As I recall the end result was very graphic, enhancing the interior. And the husband was thrilled because, not only were the records preserved, they became easily accessible on shelves. Did you know that prior to 1940 LPs were sold in plain brown-paper-wrappers? I didn't. According to Taschen, when 23-year-old Alex Steinweiss became Columbia Records’ new art director, he proposed replacing the nondescript wrapping with arresting artwork. Columbia said yes to the novel idea and soon record sales skyrocketed by over 800 percent. A new collector's edition from Taschen celebrates Steinweiss, who literally is the inventor of the modern album cover. Today Steinweiss and his wife live in Florida, and earlier this month the artist was honored at the Ringling College of Art and Design. 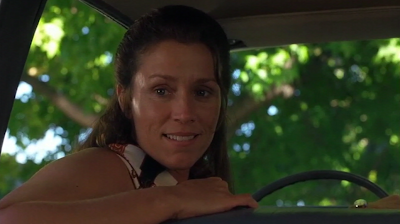 "Take a look around, see what you like," was the advice Elaine (Frances McDormand) gave young William in Almost Famous. She was talking about life -- the big picture -- but the words also apply to next week's event, Spotlight on Art. 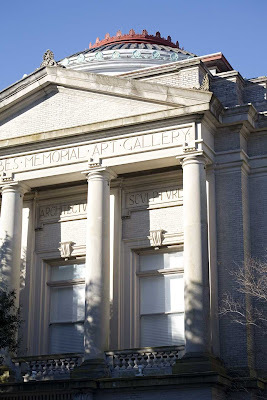 Just a reminder: the Artists Market set up on the campus of Trinity School, 4301 Northside Parkway in Atlanta, will offer 7,500 pieces of regional art, ranging in style from abstract to representational to folk. Admission is free and open to the public, and I've never experienced any pressure to buy (although last year I did happily make a purchase). So the market provides a laid-back environment in which to simply explore contemporary art. See this past post for highlights and more. 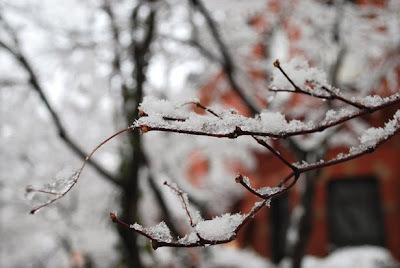 If you're snowed in but lucky enough to have power, sites like that of textile collector Marla Mallett offer a seemingly endless array of images and resources. While this post is supposed to be about browsing not buying, I will say Mallett does have many pieces that would look terrific framed and used in a mix similar to Scout Designs' above. And Scout's client, event designer Tara Guerard, just launched her beautifully revamped website. For art enthusiasts seeking inspiration, there's also Apollo magazine. 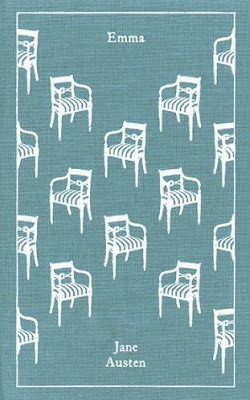 News flash from design*sponge: the Coralie Bickford-Smith-designed version of Penguin's cloth-bound Emma is finally scheduled to be available in the U.S. in March. 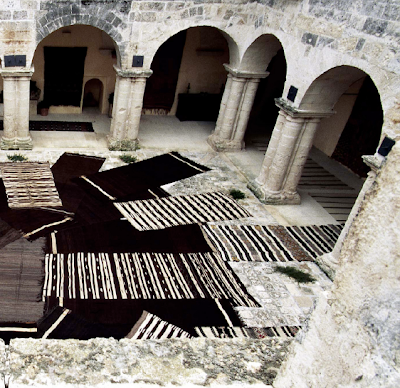 I was flipping through a back issue of Selvedge when I stumbled upon Eric Morin's photographs of Lord and Lady McAlpine's large textile collection spread out in the courtyard of their 15th century monastery in Pugila, Italy (ll Convento di Santa Maria). 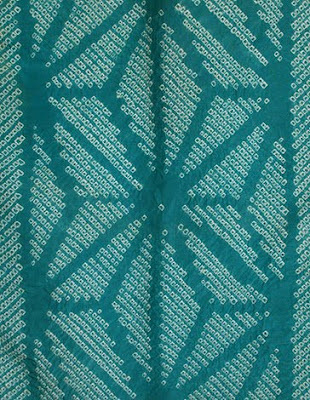 When the related story by Clare Lewis was published, the collection encompassed textiles from North Africa, West Africa, India, America and Mexico. Since Lord McAlpine is known to view the pieces as art -- something akin to the abstract expressionist paintings of the 1960s, and, as reported in the magazine, "as beautiful as a Rothko," I thought these pictures would serve as an interesting follow up to the previous post. 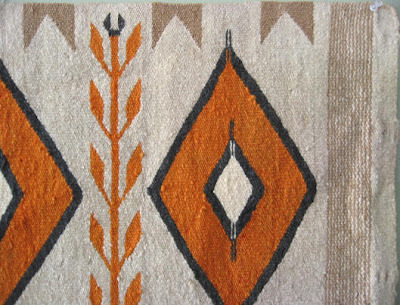 Southwestern-inspired design is clearly back in vogue, but I think it's still hard for a lot of people to see textiles associated with the American Southwest and Mexico (Navajo rugs and blankets, Mexican serapes) without thinking of Southwestern theme rooms they've seen in the past. So, sometimes it's helpful to look at the textiles in isolation. Just study the graphic lines and colors, and pretend the horse blanket is a painting. This approach opens up a whole new world of possibilities. 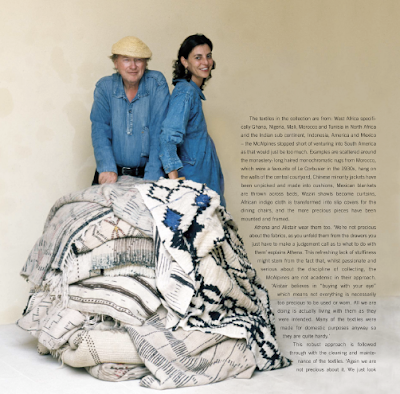 In Atlanta, Allan Arthur has a range of vintage Pueblo and Rio Grande textiles, Mexican serapes, and Southwestern pieces that could be used to upholster a bench, or thrown over a sofa or a table. And of course he also has rugs. 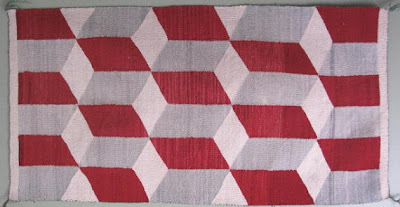 This mid-century hand-woven wool Navajo rug resembles Op Art. 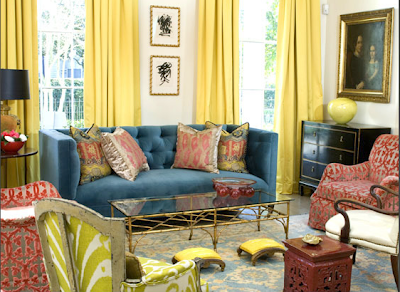 Picture a pattern like this paired with a sleek lacquered bedside table or a glamorous traditional lamp. How about Southeast meets Southwest? 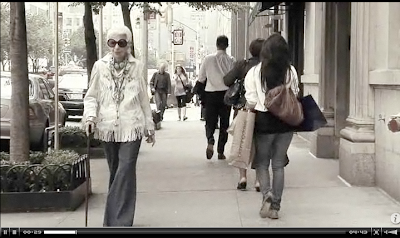 And again there's Iris Apfel. 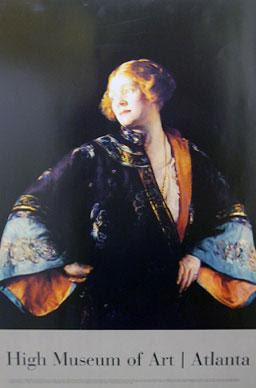 Check out her fringed jacket, above, as seen in the Peabody Essex Museum video. Whether it relates to rooms or outfits, we hear so often about drawing upon diverse cultural influences that the advice can start to sound cliche. But Iris truly does this, mixing the Far East and West, with unique results. 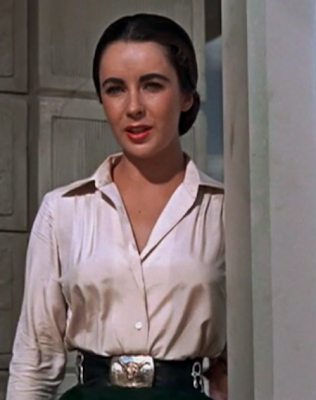 In the Western epic, Giant, Elizabeth Taylor's character, Leslie, retains her polished East Coast style throughout the film, occasionally incorporating a nod to her new home state, Texas. A similar strategy could work in a room. 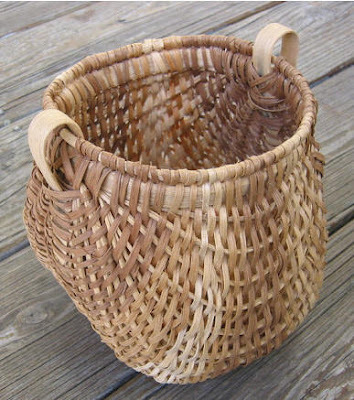 In addition to textiles, Allan Arthur has a few colorful Plains beaded objects and vintage baskets-- just to jump-start your creative process. 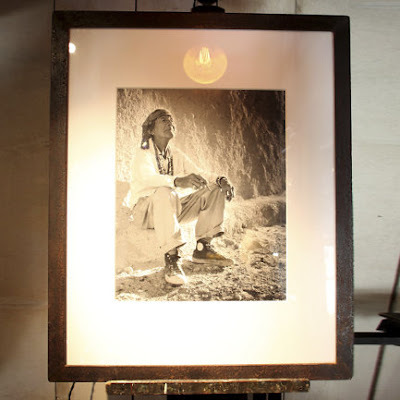 For more Navajo eye candy, I like to explore Ralph Lauren's Gift Vault. 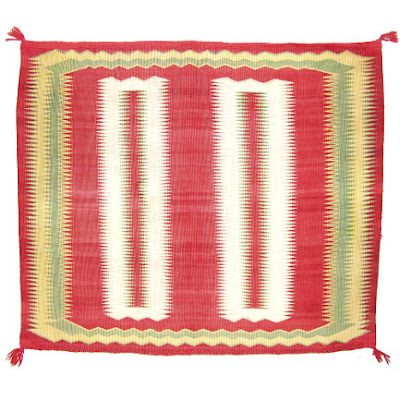 The circa 1880 Navajo saddle blanket, above, has been sold but its graphic design is endlessly inspiring. I love how the RL team describes Indian Man In High-Top Sneakers, a framed photograph from the Gift Vault (also now sold), as culture connecting.